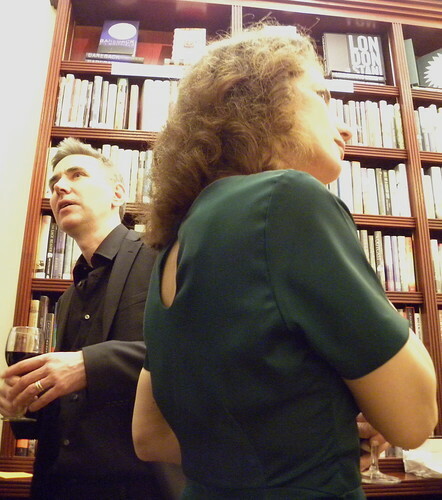 Lars Kepler has forced his coffee drinking literary ‘parents’ Alexander and Alexandra Ahndoril to take up drinking tea. They say it puts them in the right frame of mind to get on with the task of writing their bestselling crime novels about detective Joona Linna and how he goes about solving the beastly crimes they dream up over those cups of tea. 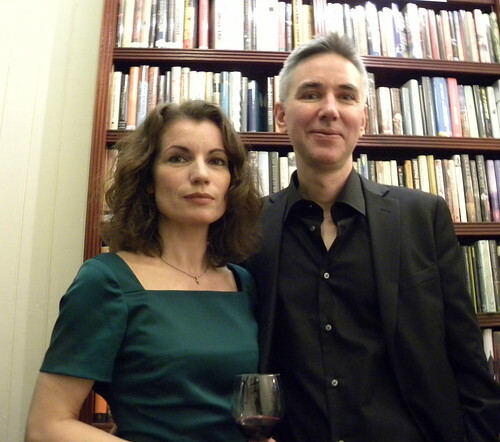 Now that their first crime novel The Hypnotist is available in English, they have come to London for a very brief book launch. Last summer I found out they have a holiday home near me in Sweden, and I asked if we could meet up. 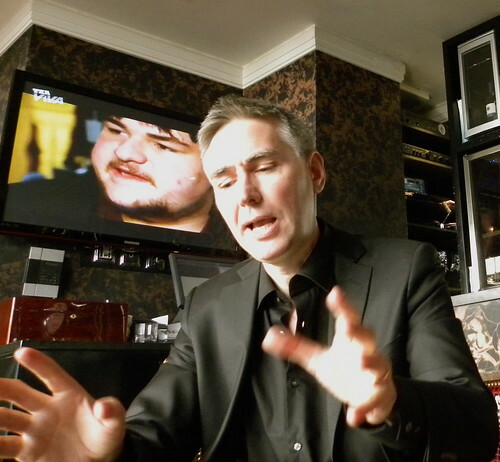 But we just never seemed to be able to synchronise our holiday dates, so the first opportunity for an interview ends up being just before the launch party near Leicester Square. We meet in the rooftop bar at their hotel, which is both full, and surprisingly smokey. But we can at least manage a couple of sofas near the bar, so we don’t have to get in the jacuzzi. The main issue in Sweden has been that these two literary authors have abandoned ‘real’ writing for a life of crime, or that’s how it has seemed from my end. I wonder if they feel they are letting this ‘real’ literature down with their Lars Kepler venture. I mention that I had noticed a spoiler in The Paganini Contract where Joona Linna is allowed to think about the past when they dug for bodies somewhere. Lars Kepler is somewhat taken aback by this, presumably because ‘real’ literature has no need to consider spoilers. Alexander mutters something about the possibility of changing the translation a little to make it less obvious. Alexandra: “Yes, at least one film a day. But Alexander falls asleep sometimes.” She laughs. Alexandra: “You’re certainly very interested in those.” Alexandra sounds amused. “November. The eleventh of the eleventh 2011, is the plan,” says Alexandra and laughs. Alexandra: “So it isn’t a classic migraine. It’s from an injury and a trauma as a result of that injury… but you find out about that in the third book!” They laugh. Alexandra: “It’s going to interesting to see your blog…” We laugh. The Ahndorils’ UK publicist comes to take them over to the launch party, along with their Swedish agent who is also in London. And before leaving the rooftop, the Blue Door MD comes up to say hello. It’s a nice evening, so I decide on a leisurely stroll to the launch venue, to watch Lars Kepler meeting the rest of the world. There was something I really wanted to know after reading Lars Kepler’s second novel, The Paganini Contract, so simply had to ask if I’d understood things properly. DON’T READ this if you don’t want your reading of the next book spoiled! Alexandra: “I think he was suffering, but he became a traitor himself. He killed his father. It was the nightmarish aspect of this that we wanted capture at the end. That which became the Paganini contract. It’s really horrible. Alexandra: “Yes, Beverly was OK. I cared about her a lot.” She laughs. This is an interview I found really fascinating, Bookwitch. Thanks so much. Did you conduct it in Swedish and translate? Love Alexandra’s dress and shoes! And no one should be allowed to write books AND wear shoes like that! Is what I think. But lots of lovely writers have amazing footwear….Nicola Morgan and her boots, JKR and those shoes on Newsnight etc. 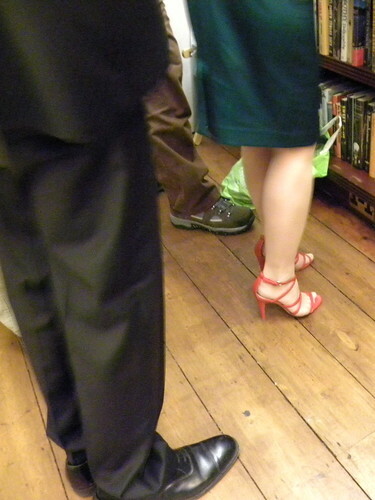 And more Romantic Novelists than I can count have splendid shoes…. Where can I get a copy of the English translation of THE PAGANINI CONTRACT? I just finished HYPNOTIST and really am into their style! You can’t. 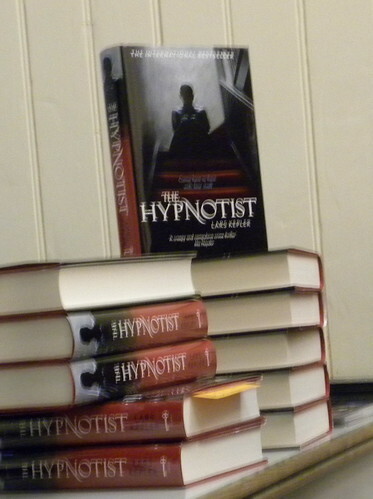 The Hypnotist is brand new, and The Paganini Contract hasn’t yet been translated. Might be faster to learn Swedish or to find another language in which to read. IS THE BOOK THE PAGANINI CONTRACT AVAILABLE IN ENGLISH? Not yet, Bruce. The British publishers wouldn’t say what their plans are, but I’d expect the book to turn up next year some time. Especially as the third book comes out in Sweden this November.